The winners of The New York Times scholarship are, front row, from left, Cynthia Pierre, Solangy Juarez, Sabrina Salas, Daisy Torres and Gabrielle Guz. Back row, from left, Aaron Jackson, Brianna Robeck, Jahmire Cassanova, Zhixing Che and Bilal Choudhry. 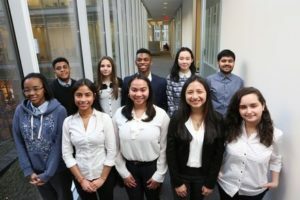 Basseterre, St. Kitts, March 11, 2018 – A national of St. Kitts and Nevis is among the New York Times Scholarship Winners Excelled Through Adversity programme. Seventeen-year-old Kittitian, Aaron Jackson is among 10 students who have endured plenty of hardship, facing down the deaths of family members, poverty, displacement, abuse and other adversities that have forced each to grow up far too swiftly. And still they have achieved, academically, in the arts and as activists. Aaron grew up in the Village of Tabernacle , St.Kitts. The village is also the hometown and current residence of the country’s Prime Minister Dr. Hon Timothy Harris who himself grew up under similar tough conditions and is now the leader of the Caribbean’s fastest growing and most progressive countries. Sarah Maslin Nir in her story wrote Jackson is now a computer whiz, dabbling in website design, anime and video editing. “When he moved to America as a teenager, he went to the Manhattan Center for Science and Mathematics, a high school ‘that had as many people as my entire village in St. Kitts’,” he said. Jackson’s creativity helped him overcome his anxiety and find his voice. “I really had this fear of being misunderstood and misinterpreted,” he said. “I want people to get to know me and what I want to portray,” said Jackson. Sarah Maslin Nir continues: Daisy Torres, 17, recalled a lavish home she used to spend time in on the Upper West Side of Manhattan — the one her mother worked in as a nanny. “It was the first time I witnessed privilege,” she said. Today she mentors young girls in her community of Jackson Heights, Queens, helping them fight gender discrimination outlined by her idol, the Nobel laureate Malala Yousafzai. “If we teach girls from an early stage to fight these stereotypes, they would be the first generation to do something about it,” Ms. Torres said.